In the past several months I have had some version of the following exchange several times. I tell a friend that I’ve just finished a book on repentance, and they respond that they find the subject of forgiveness very interesting. It’s psychologically so much healthier to forgive than to hold on to resentments, they say, signaling that they appreciate the importance of the subject. The confusion between repentance and forgiveness is widespread, it seems, and also very telling. Forgiveness, I explain, is what we are called on to do when we have been wronged by others. It is about our willingness to be generous and compassionate with those whose behavior was hurtful and unwarranted. First PersonRepentance, by contrast, is what we are called on to do when we have wronged others. It involves confession of our transgressions, feeling remorseful, making an apology, seeking forgiveness (hence the confusion in the minds of so many), offering restitution, soul-searching, and, ultimately, uprooting old patterns of behavior from our lives. In these weeks leading up to Rosh HaShanah and Yom Kippur, it seems that the need to understand what repentance is and why it matters is more urgent than ever. Forgiveness is difficult and rare, to be sure, but I want to suggest that engaging in real repentance is far more difficult, more easily misunderstood, and far less frequently practiced. Despite the many dozens of sermons that our rabbis have given on the subject of repentance, the process of repenting remains something of a mystery to most Jews (and, of course, not only Jews). Many never take seriously the need for repentance. Others start out on the path of repentance but give up when they encounter one of the many obstacles along the way. Repentance, in our time, has become a lost art. Consider several examples, which I suspect all of us will find familiar. The person who has promised repeatedly to reform her ways – to give up smoking, to make more time for her children, to be less judgmental of others -yet continually falls back into old patterns. In light of these examples – and hardly a day goes by when we don’t encounter others – we do well to ask, What makes genuine repentance so difficult? And why should we even bother trying? 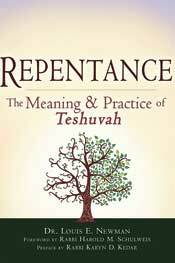 Repentance, what Jewish tradition has called teshuvah, “turning” or “returning,” entails nothing less than a radical transformation of our selves and our relationship to others. It requires profound psychological self-awareness, which includes both recognizing our own moral blind spots and exploring the character traits that cause our moral lapses in the first place. It demands that we take full responsibility for our behavior, without hesitation or equivocation, and then take action to undo the effects of that behavior on others. And if this were not enough, Judaism teaches that the process of teshuvah is never really finished. Each time we have an opportunity to make the same mistake again, we need to renounce the past and choose a different path. So doing teshuvah is literally an endless process. Forgiving others for their transgressions against us is a piece of cake by comparison. There are many obstacles on the path to true repentance: ego, self-deception, dishonesty, and stubbornness, to name just a few. Because we all want the approval of those we love, it is tempting to cover up or minimize any actions that might cause us to lose their affection. Because we all know that others expect us to make amends when we hurt them, it is tempting to feign remorse and utter empty words of apology. But counterfeit repentance, like counterfeit currency, has no value. We can’t restore our integrity or repair our relationships with others by merely pretending to repent; there are no shortcuts to an ethical life. All of which explains why genuine repentance is so rare. The work of examining our selves and repairing the relationships we have broken is arduous and always has been. The culture in which we live only compounds the difficulties. The expectation that we can find a quick fix for every problem that arises makes us less prepared to engage in the long, morally demanding work of teshuvah, and even less inclined to try. When virtual friends take the place of real relationships, we lose the impetus to cultivate the sort of emotional honesty that teshuvah requires of us. The costs of ignoring the work of repentance are not easily quantifiable, but the evidence is all around us. We see it in the lives of public figures – politicians and corporate executives – who get caught in some deceitful or fraudulent behavior, and then baldly deny it. We see it on daytime television shows, where people confess their transgressions before a live audience for their entertainment, never displaying a hint of the contrition or soul- searching that is the mark of repentance. Most of all, we know it in those quiet moments in our own lives when we recognize that we are not living up to our own moral standards, yet don’t know how to restore our own sense of wholeness and integrity. The ultimate benefit of doing teshuvah is that it offers us a way to overcome our past precisely because we have confronted and taken full responsibility for it. It enables us to escape the sense of guilt – in some cases, even despair – with which many of us live. In its place, we come to live with self-acceptance and hope because we know that moral renewal is always a possibility. We may even discover, as the ancient rabbis taught, that through repentance our transgressions can be transformed into merits. The rewards of doing teshuvah are commensurate with the effort we expend. This year when we celebrate the Ten Days of Repentance, which are the holiest days on the Jewish calendar, we would do well to focus on what repentance is and what it is not. Surely it is easier to think of this as a time to forgive others for their transgressions against us. But it is far more rewarding to remember that this time is really a gift, an opportunity to engage in searching moral introspection about the ways in which we have harmed others and so failed to be our best selves. Tradition has laid out the path to follow, as well as how we can work with our internal resistance and what we stand to gain in the process. All that we require is an accurate understanding of what is required of us and the will to begin anew.